CryoSTEM tomography (CSTET) is an alternative to the better-know cryoTEM tomography, for which thickness limitations are several hundred nanometers. We can probe 3D structures of cells up to around 1 micron in thickness. 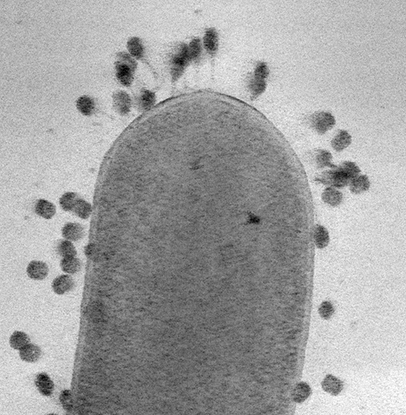 This cryoSTEM tomogram shows T4 phage viruses attacking an E. coli bacterium. Your browser does not support HTML5 video. Try to update to the latest version of Safari. The movie below is stepping through the 3D volume that is reconstructed from the tilt series above. The scalebar is 400 nm.